Anti-fluoridation activists work very hard to deny that ingested fluoride has a beneficial role. They take description of the “topical” mechanism that fluoride in saliva plays in inhibiting tooth decay out of context to deny any other role of fluoride. Even then they distort the research to claim fluoride must be applied as toothpaste – it doesn’t. Anything to deny a role for fluoridated water (see Fluoridation – topical confusion and Topical confusion persists). But research findings do support a beneficial role of ingested fluoride during teeth development – that is on pre-erupted teeth. This was illustrated again in a recent paper reporting incidence of tooth decay in South Korean children. One group lived in an area where there had been no water fluoridation. The other group in an area where fluoridation had stopped 7 years before. Cho et al (2014)* found children of age 11, who drank fluoridated water during their first 4 years (before eruption of their first permanent teeth), had significantly less tooth decay at than children of age 6, who had not had access to community water fluoridation during their first 4 years (see figure below – results for decayed missing and filled teeth (DMFT) expressed as a ratio of results for children in previously fluoridated area divided by results for children in never-fluoridated area). 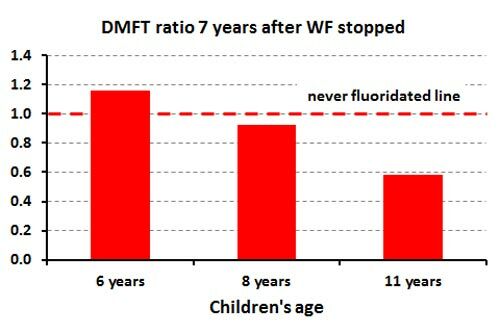 The DMFT ratio for the 11 year old children, who had received fluoridated water in the first 4 years during tooth development, is much lower than 1 (the result expect of fluoridated water had no effect). The difference is statsically significant for 11 year olds, but not the 8 year olds. The data shows a clear beneficial effect of fluoride ingested during tooth development. *Cho, H.-J., Jin, B.-H., Park, D.-Y., Jung, S.-H., Lee, H.-S., Paik, D.-I., & Bae, K.-H. (2014). Systemic effect of water fluoridation on dental caries prevalence. Community Dentistry and Oral Epidemiology. This entry was posted in Health and Medicine, SciBlogs, science, Science and Society and tagged fluoridation, fluoride, SciBlogs, South Korea. Bookmark the permalink. there are so many peer reviewed reports proving that ingesting fluoridated water is of no benefit and indeed can be quite dangerous for people with certain illnesses. It is time the Governments followed other countries and allowed the people to have a say as in America and Canada many have voted to end fluoridation. Singh, K. A., & Spencer, A. J. (2004). Relative effects of pre- and post-eruption water fluoride on caries experience by surface type of permanent first molars. Community Dentistry and Oral Epidemiology, 32(6), 435–46. Singh, K. A., Spencer, A. J., & Brennan, D. S. (2007). Effects of water fluoride exposure at crown completion and maturation on caries of permanent first molars. Caries Research, 41(1), 34–42. Now tell me what “peer-reviewed” reports you have “proving” ingested fluoride has no benefit. I am all ears and eyes – you may be able to convince me of your claim if you can produce some good evidence. Where does that leave me? Never fluoridated for 71 years, all my own pearly whites. Yet once fluoridated and having to shower and use fluoridated water, I have psoriasis in my scalp; eczema in my ears and rashes on my body. Surely it isn’t because I am getting on in years. Ken you seem knowledgeable what do you consider is wrong?? Cindy, it isn’t clear why you are asking these question here – they do not seem related to the article. However, I would advise you to talk with your health professionals about your complaints – they will know far more than people on the Internet or in activist groups. Can’t see these how complaints could physically related to fluoridation but of course they could be psychosomatic. Please show all of us, what is the benefits to forcing chemicals on every single man, woman and child, without proper diagnosis; or monitoring for side effects? Alfamildura, it might be a bit beyond your dogma but a surface mechanism which is well know to initiate demineralisation and tooth decay on some tooth surfaces does not preclude a role for the well known stabilising effect of F on the bioapatite structure. The epidemiology backs that up. Pass on the full text paper Ken, and we will have a closer look. Meanwhile, it should be noted that this one paper’s assumption contradicts many others regarding the necessity of ingesting fluoride. Aswla, your comments have absolutely nothing to say about the content of my article. It seems that the word “fluoride” has sent you off on an angry, but irrelevant, tangent. Afamildura, what specific assumption are you talking about? What you fail to see is that you are referring to opinions of people who are stressing the surface reaction. But that surface reaction in no way conflicts with the properties fluoride confer on bioapatites. These two mechanisms can complement each other – consider the role of tooth wear on providing sites for demineralisation. In the end though you have to deal with the objective facts that are reported in the paper. The full text should easily be available on line as I did download it myself. However I do not have access to my database of references tonight. Probably much quicker for you to download it yourself. Have a search on google scholar which usually provides links to PDFs. Ken, Cho et al. (2014) conclude, “This [study] suggests that the systemic effect of fluoride intake through water fluoridation could be important for the prevention of dental caries”. That is not an absolute statement, as as we show, is contradictory to conclusions of other research teams. As you are aware, “The actual mechanism of fluoride action is still a subject of debate” (Hellwig & Lennon 2004). Perhaps it is beyond your dogma to grasp this, but your claims of a pressing need for ingestion of fluoride can be disputed. What part of ‘informed consent to treatment’ does mandatory fluoride fall under Ken? How does that relate to total human health?? PS. Please answer this question DIRECTLY: What part of ‘dental health’ does this Policy statement fall under with (forced) fluoridation, and a one-size-fits-all approach) ? Ken, we are trying to establish why you seem to insist ingesting fluoride is essential for dental health, when numerous papers cast doubt on this assertion, as an outdated belief. Afa, Everything in science can be disputed – and we encourage this. That enables us to compare ideas against reality – we end up discussing the objectively measured facts – like those present in Cho et al’s paper. Life you want to dispute them go ahead. They are clearly presented in the graphic. Quoting opinions or simple statement preferring a separate mechanism does not deal with the facts. The facts are consistent with the complementary role of both mechanisms. The work of Singh et al supports the idea that the one mechanism or another can be dominant at different tooth surfaces. Aswl, you still seem to have come to the wrong place. This article is not at all about medicine. But it is about teeth. Why not discuss that instead? Ken, quite happy to read the Cho paper in full, but it seems you are using it to suggest the ‘necessity’ of fluoridating water supplies when there are other alternatives to achieve the desired outcome of improved dental health. The other alternatives focus the fluoride where it is most effective – the teeth/mouth – and avoid the issues surrounding mass ingestion, which is ethically and scientifically questionable. Ken, you are still sidestepping the valid questions. And ‘teeth’, when dealing with ingested fluoride, affects all the body, not just teeth. Answer the question: What part of ‘dental health’ does this Policy statement fall under with (forced) fluoridation, and a one-size-fits-all approach) ? Ava – you might be “trying to establish why you [I] seem to insist ingesting fluoride is essential for dental health” but I aren’t. I am simply reporting the facts from an interesting scientific paper. These are consistent with a role for ingested F during tooth development before eruption. As a chemist I do not find that at all surprising but I do find the actual measurements intriguing because it is usually very hard to test for this in practice. This difficulty is usually acknowledged in reviews. I know that some people have stressed the dominant role of the surface reaction, partly because they think it is relatively new knowledge (it isn’t). It is not unusual in science for one aspect of knowledge to be stressed over another – but usually the better scientists do recognise that such simple models can give a false picture of reality. That is why I think the facts, the determined data, is far more important than anyones’s opinion. Aswl, can you cite anything that supports your idea that community water fluoridation somehow equates with being a ‘procedure’? No, Alfa, I actually aren’t talking about necessity at all in my short article. Simply bringing the data to readers’ attention so they can draw there own conclusion about necessity or not. The main purpose was to show how anti-fluoride activists have been misrepresenting this issue. That is also why I mentioned my other articles on the so-called topical mechanism which has also been thoroughly and dishonestly misrepresented by anti-fluoride activists. Drop the public water fluoridation program, and instead, fluoridate a wide range of bottled water. Mark the bottled water label clearly as “contains 1mg/L fluoride” or whatever amount. After all, the National Research Council did suggest as much in 2006, “To assist in estimating individual fluoride exposure from ingestion, manufacturers and producers should provide information on the fluoride content of commercial foods and beverages” ( http://www.nap.edu/openbook.php?record_id=11571&page=87 ). The dental lobby, yourself and others who support the current public water fluoridation program can switch focus to supporting the bottled water program instead (such as subsidising and promoting fluoridated bottled water). And in turn, those who oppose the public water fluoridation program on ethical and other grounds can can drop their campaign of opposition, as there would no longer be anything to oppose because those who choose to ingest the fluoridated bottled water would be doing so as a personal choice. At present, it is a fact that, “The major dietary source of fluoride for most people in the United States is fluoridated municipal (community) drinking water, including water consumed directly, food and beverages prepared at home or in restaurants from municipal drinking water, and commercial beverages and processed foods originating from fluoridated municipalities” ( http://www.nap.edu/openbook.php?record_id=11571&page=24 ). Obviously this is a problem for people who wish to monitor their fluoride intake, when virtually no products are labelled as “prepared using fluoridated tap water. Bottled water on the other hand would be a more targeted approach. Would you be willing to throw your support behind such a compromise deal? If not, why not? Ken, I’m pretty sure I’ve seen you in the past accusing the anti lobby of never quoting peer reviewed papers, so when we quote peer reviewed papers that say fluoride ingestion is or may not be necessary for optimal dental health, you’re still not satisfied. Although your explanation of why you focused on this article in this case is accepted. Thank you for drawing our attention to it. Afa, in my city we have had fluoridation of water for years and this has been acceptable to the vast majority of residents. When the council stopped fluoridation last year there was an uproar and a new referendum showed the support for the fluoridation remained. The council has now decided to reinstate fluoridation. I put my support behind the political issue that the council should follow the democratically expressed views of voters. I also put my support into opposing the disgusting misinformation being promoted by political activists who are trying to stop fluoridation. The first point (acceptance of a democratice decision) has been. Nieves. The second, unfortunately, will go on for a long time. Misrepresentation of science is an ongoing problem. Personally I do not worry too much about fluoridation itself. If residents democratically opposed I would accept that. But I am definitely against scientific misrepresentation. As for your specific proposal of bottled water I don’t support it. It is a pathetic alternative to a public health policy of fluoridation of water, salt, milk, etc., and provision of adequate dental health facilities. We could go into this more deeply if you wish – it really comes down to the nature of an effective social health policy being something that does not require special individual action, planning or purchase. Afa, who would be able to access your bottled water idea? Would consumers pay for this? Ken, thank you for your clarifications. Whilst we respectfully don’t agree, we’d be happy to consider your elaboration on the bottled water issue. Oh dear AFAMI, this is well traveled road from anti-f activists, when they’re tired (or disinterested) in discussing the topic of the day they reach for an end game solution that is clearly never going to happen. In case you have forgotten, today’s topic is how ingested fluoride for the beneficial to dental health. Afa, I have never critiqued the antis for not quoting peer reviewed papers at all – you are mistaken. I have criticised people like Connett and Waugh for citing material dishonestly and misrepresenting the papers. I abhor the dishonest motivated distortion of science involved in such misleading citations. And I am afraid you are doing this too with your citing of opinions and ignoring the facts in front of you. Why not discuss the facts. Why do you think the conclusions Cho et al draw are wrong? Please base you answer on the facts in their paper. What about the dose? How do you control the dose when construction workers, miners and athletes drink up to 10 liters a day? Christopher, at the moment (in the state of Victoria, Australia), consumers and tax payers are paying for the promotion, construction and maintenance of fluoridation programs/facilities. The state government foots the bill for most of the construction costs as far as we know, then the ongoing costs are passed onto the customers of local water authorities. So of course, someone would also pay the cost for the bottled water program, but that is the reality right now anyway. People are paying for fluoridated water. Now, we agree with Ken on the democratic issue. Sure, if one community really, really wants their water fluoridated and their cross contamination to other communities is negligible, then they should be able to fluoridate their water supply, as a community. Although, there is still the issue of the majority forcing a treatment on the minority within the community, but the community itself should be able to thrash this out on its own. Where we have a real problem is that the state government of Victoria has forced fluoridation on the entire state – all communities – without a vote being taken. Tax payers were forced to pay all the costs, whether they wanted to or not; and consumers are paying the ongoing costs, whether they like it or not. This crosses the line on a number of levels. A logical solution would be to say let’s stop forcing water fluoridation on everyone – many of whom do not want it forced upon them – and offer an alternative to those who really do want to consumer fluoridated water. If you could transfer the costs across to the new program, it would be a) a more targeted treatment; b) informed consent would be obtained; c) it would be cost effective. Yes, in short, it would cost. But it’s costing now. The difference is consumer will and consumer choice. Ken, you ask, “Why do you think the conclusions Cho et al draw are wrong?” We never said they were wrong. We said other papers draw the conclusion that CWF/ingestion of fluoride is no longer considered essential. So just placing the Cho et al paper in the context of these others. We also said we’d read the full text of Cho et al and look more closely at it. Afa, have a read of the paper and get back to us on the specifics. Also, if you can find any specific evidence to show ingested F plays no role in the other papers you refer to, rather than opinion, please bring that up too. I have probably read the same papers as you and I don’t recall any evidence at all. PS. Chris, furthermore, the Health (Fluoridation) Act 1973 says, “No person has any right of action against a water supply authority… in respect of anything done in regard to the fluoridation of a public water supply” ( http://www.austlii.edu.au/au/legis/vic/consol_act/ha1973201/s4.html ). We also hold this as unethical on principle, because it allows a supplier of a treatment to a) force this treatment upon its consumers; and b) take no legal responsibility for any potential undesirable outcomes. In normal society, companies and individuals are always legally accountable for their actions and in the case of the suppliers of water fluoridation, they should not have any special protection. Once again, if a consumer made the conscious choice to buy fluoridated bottled water, they at least made that choice, whereas wide-scale fluoride contamination of a wide variety of foods and beverages resulting from current fluoridation programs ( as confirmed: http://www.nap.edu/openbook.php?record_id=11571&page=24 ) makes this choice impossible – and no one is legally accountable for it. No worries Ken. We’ll run it by our people too for further analysis. Here are some comments taken from something else I am writing which I think is relevant to the freedom of choice argument. It is wrong to see fluoridation as simply a “freedom of choice” issue. It is really an issue of balancing freedom of choice against social good. We often have these discussions in our society because social organisation involves balancing these two extremes. In practice we usually find some procedure to achieve a working balance on issues – often in ways that allow actions producing social good while still maintain a high degree of personal choice. Consider social goods like free secular education and public hospitals. Our society supports these (or something close to them) while at the same time not denying freedom of choice to those members of society who refuse to use them. The fact that individuals making that choice to avoid the social good incur costs, sometimes substantial costs like medical insurance and school fees, does not deny the fact they are taking advantage of their freedom of choice. The fact that individuals who wish not to take advantage of a public health measure like CWF may incur some costs in purchasing other sources of drinking water or kitchen filters (at far less cost than education and medical insurance fees) does not mean their freedom of choice is being denied. In our society democracy enables decisions where values/political issues are involved. Ken, I we would ask Dr. John Harris, whom you quote, “what risks, damage & costs” have been imposed on developed European nations who do not fluoridate their drinking water? It seems they are getting along just fine, with just as good teeth or even better teeth than ours. Ergo, there are alternatives to water fluoridation. Ken, we never claimed that “ingested F plays no role”. We are just highlighting, as Locker et al. (1999) do, that “The magnitude of the effect is not large in absolute terms, is often not statistically significant and may not be of clinical significance” ( http://www.health.gov.on.ca/en/common/ministry/publications/reports/fluoridation/fluor.pdf ). Although Locker et al. (1999) did also say, “The effect tends to be maximized among children from the lower socioeconomic groups,” it is worth noting that the York Review (2000) showed this evidence to be of, “poor quality, contradictory and unreliable” ( http://www.york.ac.uk/inst/crd/fluoridnew.htm ). “These findings suggest that achieving a caries-free status may have relatively little to do with fluoride intake, while fluorosis is clearly more dependent on fluoride intake” ( http://www.ncbi.nlm.nih.gov/pubmed/19054310 ). Yes, Afa, there are other fluoridation procedures beside water fluoridation. I certainly do not dogmatically insist on one or the other. However, I can see that water fluoridation works very well in NZ and no one is seriously suggesting alternatives here. I see no reason why I should at this stage. Afa, you are cherry picking opinions again. 🙂 Apart from that, most reviewers do recognise the difficulty of making the epidemiological measurements required to demonstrate the role of ingested F. Cho et al had a good situation which showed the effect very clearly. Others have also showed the effect – Singh et al, for example. Granted, the surface mechanism is much easier to demonstrate in laboratory experiments but we should not let us blind ourselves to the role of ingested F. Nor should we allow the reductionist aspect of a laboratory experiment blind us to the subtleties of the real world. Ken, it is positive that you don’t dogmatically insist on one or the other, and, as you and I have previously discussed ( on our blog, http://afamildura.wordpress.com/2014/04/04/conspiracy-the-favoured-word-of-pro-fluoridation-extremists/comment-page-1/#comment-1500 ), you don’t agree with forced fluoridation without a democratic vote. Also positive. In that case, hypothetically, what would you support as an alternative to the fluoridation of public water supplies, if one were seriously offered? Since other countries seem to get along just fine without water fluoridation, surely New Zealand and indeed Australia could find a better way to improve dental health, which would put an end to all this fighting over public water fluoridation. As we stated, if the government simply stopped forcing it on everyone, then we have much less reason to exist. Ken, we merely wish to clarify that this “enormous benefit” as often claimed, is not as huge as everyone is generally led to believe. If the benefit is so small, and alternatives exist, then water fluoridation becomes less essential and could be phased out without major consequence. I have already pointed out, Afa, in NZ no one seems to be interested in an alternative. Water fluoridation works well as a social policy, it is safe and effective. Most people seem to accept it. Therefore alternatives don’t get promoted. It is not my place to do such promotion. I am happy with our current situation – as are most of my city. It should be clear from my writing that I don’t see anyone being forced to do anything. Far from it. As for “putting an end to the fighting,” as I said before I believe the misinformation and a anti-science attitudes are far wider than fluoridation. They certainly still exist wherever alternatives like fluoridated salt and fluoridated milk are being used. Afa, you are now resorting to special pleading. As I said, the majority here are happy with the current situation and don’t see any need to change it. In fact the special pleading of the anti-science crowd is being more and more recognised as pathetic. I must now recharge my iPad so am signing out. Ken, to clarify, you and I have discussed the difference between your country’s situation as opposed to us in the state of Victoria. Ken, we never plead. It’s weak and pathetic, although we do like to stand toe to toe. 😉 Night night. You seem to be able to discuss these topics far better than most anti F people I have encountered. I would be interested as to how you view other people (groups) who also hold anti F positions? Some I have encountered are just outright crazy! While most tend to make the same silly tired (cut and paste) arguements. ohhh Ken I really thought we had heard the end of you after Pr Connet, blew your assertions out of the water. why you find it necessary to promote this sketchy business of forced medication against may peoples consent is beyond my comprehension. Why is it so difficult for you to realize that there are people who do not give consent to medication in there water? Why are we being subject to this mad science? your graph shows such a miniscule difference in DMFT ratio. To spend that much money on fluoridation infrastructure, to achieve such a small outcome, and upset a portion of the community that opposes WF is sheer stupidity! Strange, I had the impression it was Paul Connett who ran away from our exchange with his tail between his legs. 🙂 He, and his local mates, certainly had their noses out of joint. But Mathew, you seem confused. No one here is forcing medicine in anyone. As for consent, a lot of my attention has been aimed at drawing attention to the fact the Hamilton Council made a decision against the consent of voters. Ken said “I am happy with our current situation – as are most of my city”. That is a stupid statement given that over 60000 citizens in Hamilton didn’t participate in the referendum so their happiness or otherwise is not known. Most of the city did not vote or voted against fluoridation. Given your penchant for accuracy and honesty I now expect you to withdraw and apologise for your grossly inaccurate and ill-informed statement. Don’t be silly, Boj. Most of the city did not vote or voted for fluoridation. Anyone unhappy would surely have voted. You have a very dangerous concept of democracy. Society must ensure people like you are not allowed to impose their minority positions undemocratically. why you find it necessary to promote this sketchy business of forced medication against may peoples consent is beyond my comprehension. Taking a r remedial course in high school science could cure that for you Matt. They keep using these terms that have been debunked again and again and again and again and again….as if somehow we won’t notice or remember? How long do you think it will be before some semi-literate will show up with another cut-and-paste? That’s a winning move. To answer that question we would say yes, totally agreed, many are outright crazy. However, in between there are many genuine, well-informed people who can make rational arguments about why they oppose fluoridation. In a serious and open discussion, those who hold a pro-fluoridation position, who are interested in a genuine dialogue on the matter, should be focusing on the latter of the aforementioned camps and ignoring the former. In short, our view is that the use of public water supplies with the stated purpose of treating a population for a disease (in this case dental caries) conflicts with the principle of informed consent to treatment, does not adhere to the principles of individualised treatment, overrides the democratic principle (when forced) and could be achieved safely and effectively by alternative means. The issue of margin of safety is also important, as once a water supply is fluoridated, the dose cannot be controlled nor can the potentially subtle yet important effects be adequately monitored on a population wide scale. Now if you are on the pro-fluoridation side of the coin, you may not agree with everything presented here, but if you respect your opponents in any way, that’s where I would begin. Instead of dismissing them all as crazies and conspiracy theorists, make a coherent set of rebuttals. Publish those, and we can all continue the discussion from there. Ultimately, what we would like is to see a compromise come about, agreed upon by both sides, because I think we can all agree that this entire issue has become a corrosive, toxic mix and is becoming a major waste of time and a distraction from more pressing issues. If public health wants to deliver fluoridated water to the masses, they will always encounter opposition if they try to do so by mass treatment by public water systems and this will go on forever. However, if a better way is found, the opposition will be greatly pacified. We are sick of this entire mess, perhaps just as much as our detractors. AFA, that sounds all very reasonable. Instead of dismissing them all as crazies and conspiracy theorists, make a coherent set of rebuttals.<Instead of dismissing them all as crazies and conspiracy theorists, make a coherent set of rebuttals. There are two things wrong in your appeal. Firstly, when ill-informed and scientifically illiterate crazies present PRATTS, over and over and over again, it is perfectly justified to dismiss them for what they are, fools. It is also salient to examine where the repeated PRATTS originate from, and where and who they still promotes them. Hint, it isn’t the scientific, medical or public health sectors. I suggest the anti fluoridation lobby get its own house in order before demanding “respect [from] your opponents”. However, I concede that that is unlikely to occur given the massive amount of total shite it has been promoting for over half a century. Secondly, the scientific, medical and public health community have presented comprehensive and coherent rebuttals (also Ken in this blog) , over and over and over again. However I gain concede that this is neither understood nor heeded by those whose ideology it confronts. And in truth, it is a battle of ideology, not a battle over the science or evidence, because equally truly, the science and evidence is perfectly clear. In my view your points an consent are valid and arguable. However they rest on two points, 1) that fluoridation is medication and 2) that it is in someway harmful. Over and over again your lobby has lost the first argument – in the courts, political arena , scientific, medical and public health sectors. Water treatment with fluoride is rightly regarded as adjustment of a naturally occurring substance/ion/element/mineral (take your pick, someone will argue over the semantic definition, regardless) for optimal health. That is why the anti fluoridation lobby constantly misrepresents and grasps for any scrap of science (anything will do) that might suggest fluoridation is harmful. The anti’s evidence is all over the place: if one argument doesn’t work, well then, here is something else, never mind. as we’ll recycle the earlier argument again (and again) later on. All clear indication of ideologically driven argument. 1) that fluoridation is medication and 2) that it is in someway harmful. Has the anti fluoridation ever considered the logical inconsistency of the two platforms they push, given above? Oh, I know, it’s a harmful medication – silly me and evil health authorities. Thank you for your replies and your points are acknowledged. However, I must correct you on a key point: The medication issue. Richard, I challenge you to argue that fluoridated water is not a form of treatment for disease. Forget this mass medication rubbish. I’m specifically talking about treatment. And if you agree that dental caries is a disease and fluoridation is advertised as a treatment for this disease, then you have the issue of informed consent to treatment. There is no doubt that this is an enshrined human right: https://www.facebook.com/notes/anti-fluoridation-association-of-mildura/final-nails-in-the-ethical-coffin-of-water-fluoridation/314696628676056 – so quibbling over fluoridation’s status as “medication” or not, in our view, is pointless. We argue that it is indeed a treatment (which its proponents openly state), and as such, forcing it on populations constitutes a breach of human rights, inherently and indisputably. You can argue till the cows come home that fluoridation is safe and is not medication, but from this perspective, it doesn’t matter. Richard, I challenge you to argue that fluoridated water is not a form of treatment for disease. Is ensuring you get enough vitamin C in your diet in order to avoid scurvy a treatment for disease? Better sign a waiver before visiting the supermarket. Same for any other dietary intake of trace elements necessary or desirable for a healthy metabolism, including getting enough iodine to avoid goitre. Forget this mass medication rubbish. If only. Every kook from Crankland arrives here yabbering on about it. Richard Christie, your comparison is flawed. While vitamin C is an essential nutrient, fluoride is not an essential nutrient, or a nutrient at all. More importantly, and where your comparison is primarily flawed, is that unlike Vitamin C, which you can get over the counter, fluoride MUST BE PRESCRIBED. Fluoride is treated as a drug by the FDA, and therefore you cannot get it over the counter…even in the same .25mg dose that you get in 10oz of fluoridated tap water. Second, you ignored the challenge because you know fluoride is added to the water supply to prevent dental decay, and for no other reason. Therefore we are practicing medicine using our public water supply. A better comparison then vitamin C would be whether we should increase level of Lithium to the water supply. Like fluoride, it’s in the water in trace amounts already. Like fluoride, you cannot get lithium over the counter, but requires a prescription. Like fluoride, it is used to prevent a health problem, in this case, depression. You lose the informed consent argument. But all of this is moot anyway because the argument that will eventually win over the fluoride debate won’t be informed consent, but that there are now much more effective and efficient methods of reducing dental decay then water fluoridation. The dental industry has come a long way, and now with the advent of fluoride varnishes, sealant programs, universal healthcare for the poor, and tooth brushing programs in schools, there will NO LONGER BE A NEED TO WASTE MONEY ON A 70 YEAR OLD PROGRAM THAT WASTES 99% OF THE MONEY DOWN THE DRAIN AND FAILS TO REACH THOSE AT GREATEST RISK. The dental industry itself has made fluoridation obsolete. We will win using your own data that shows that these other programs have proven more effective, more efficient, and less controversial. In the end you will fall on your own sword. “Is ensuring you get enough vitamin C in your diet in order to avoid scurvy a treatment for disease?” — Yes, but I choose that product and control the dose I get. It is not forced into my water supply to treat me without my consent. Big difference. Furthermore, Vitamin C is an essential nutrient. If you don’t take it, you develop disease, as you note. Please list any research that shows that withholding fluoride from the diet results in a disease? Are you suggesting that if I don’t ingest fluoride, I will develop a disease as a result? I’d be interested to read the research behind that. And still, even if you had that research, you still need my informed consent before you started adding the substance to my water supply with the stated intent to treat my body for disease, no matter how “good” you claim the substance to be. Richard, I am the Chief Health Officer of ‘State X’. Research shows that Aspirin is good for thinning blood. So I am passing a law that forces all water supply authorities across State X to add Aspirin to their public drinking water. I will not be able to control the daily dose of Aspirin people get, because I cannot control how much water they will consume. I don’t have access to their medical histories, so I can’t say the Aspirin will be consumed by those who need it most and will not harm those who don’t need it or may be sensitive to its effects. I will not be able to tell them how much total daily Aspirin they are getting, because all products processed with Aspirinated tap water will contain various concentrations of Aspirin and will not be labelled as such. Even though I am treating the population, by my authority I decree that their consent is not required because I say it’s good for them. And just to be safe, I am going to ensure that no water supply authority can ever be sued for any potential negative outcomes resulting from the treatment. Oh and by the way, I will force everyone to pay for the treatment program via their tax dollars, whether they want the treatment or not. There are alternatives to deliver the Aspirin to individuals, but I’m just going to force it into all water supplies anyway. You’d probably object to this logic for Aspirin or any other treatment agent for human bodies being added to your drinking water without your permission, but fluoride seems to get a special exemption. Do you believe that public drinking water supplies are good systems for delivering treatments for the human body? If your answer is yes, please list what other treatments (for the human body) you would support being delivered via public water systems. We already know you support fluoridated public water systems for the treatment of dental caries, but why stop there? Surely, by the same logic, you would support many treatment programs for the prevention and alleviation of many diseases being administered via drinking water. Furthermore, what treatments would you NOT support being administered via public water systems? And why would you NOT support them? Where do you draw the line between what is okay to add to public water supplies for the purpose of human treatment, and what is not okay? I often see these arguments – however I think that those who use them are relying on their confirmation bias and working backwards from a predetermined view that they have an enshrined legal “right” to refuse “treatment”. Legislation, using legalese like “breach” or “contrary” is often quoted with almost religious zeal. You nearly did when you mentioned “human rights”. After these ‘rights’ are explained, they are then blanketed over an ill defined explanation of ‘medication’ (in your case, treatment) in an effort to gain legitimacy or ‘proof’ that somehow an egregious error has been made by the legal fraternity by not picking up this obvious assault on basic human rights. I notice you provide the link https://www.facebook.com/notes/anti-fluoridation-association-of-mildura/final-nails-in-the-ethical-coffin-of-water-fluoridation/314696628676056 which points to many so called of these ‘rights’ and I assume you are using as ‘proofs’ to support your position. Upon closer inspection of these ‘rights’ it is clear that they are not applicable to your argument nor CWF. If they were, by all means take legal action – by your own arguments it would appear simple. Richard had it right when he touched on Vitamin C and scurvy. There are plenty more examples. Looking at your rationale AFA, I will break down the simplistic syllogism you unsuccessfully tried to employ. 3) Conclusion: CWF must require consent. Each of these are flawed and easily disputed in the context of CWF, yet when employed as a rhetorical device is powerful if somewhat disingenuous. More importantly, and where your comparison is primarily flawed, is that unlike Vitamin C, which you can get over the counter, fluoride MUST BE PRESCRIBED. Fluoride is treated as a drug by the FDA, and therefore you cannot get it over the counter…even in the same .25mg dose that you get in 10oz of fluoridated tap water. So…given this, can you tell me, do I need to have a prescription for fluoridated water (0.7ppm)? are you confusing two different substances here on purpose or are you being disingenuous? Well…yes. Perfect for treating dehydration. You seem to be making another common mistake, smudging the line between prevention and treatment – I see you’ve done that a few times now. We already know you support fluoridated public water systems for the treatment of dental caries, but why stop there? If you wish to play semantic games around the definition of ‘treatment’ then this gets nowhere, scientifically. Why stop there…mmm why indeed. what would you propose? Making a false analogy to say…lithium (I have heard that one a few times) or aspirin as you have done AFA? C’mon, you started off so well…why are you introducing such dumb arguments? Research shows that Aspirin is good for thinning blood. So I am passing a law that forces all water supply authorities across State X to add Aspirin to their public drinking water. Does aspirin occur naturally in the water? The air I breathe or the food I eat? Or the sea I swim in? How would I control for it if it if this was the case? Aww c’mon AFA, you are beginning to start like the Krazies we spoke about earlier on. Your right, this is all about semantics. However, I’m going to continue to make these arguments with councilors and legislators because they work. Your opinion is meaningless, just like this blog. We don’t have to convince you of anything, we just have to convince decision-makers. They like simple clear arguments that make logical sense, which is why more communities are now ending the practice. So carry on wasting your time staring at your computer, I’ll be lobbying my legislators who continue to understand and agree with the logic that fluoridation is a treatment, and an outdated one at that. My arguments need only make sense to them. Who cares what ken’s longwinded analysis is, decision makers don’t have the time to care about anything but the most basic arguments and most basic reasoning. I know you have a tendency to reading what only what you want to Fred. No, it’s not all about semantics. Some of the silly arguements that are used are. The rest is about science and public health. Both of which you appear to have no concern for. Obviously not you, perhaps it hurts your head to read anything complimacated. On the button Chris. I’ve nothing to add to the answers you provided to questions and to your analysis of the argument offered by AFA, i.e: same old argument, different labels. I also regard as illuminating Fred Norris’s willingness to elevate effectiveness of argument over validity of argument. “The Court concluded that although fluoridation has therapeutic purpose, being the reduced incidence of dental decay, it does not constitute “medical treatment”. Therefore, the right to refuse to undergo medical treatment was not engaged. The Court found that the wording of section 11 strongly suggests that “medical treatment” refers to medical services given by a qualified practitioner to an individual patient in a professional setting. By contrast, fluoridation is a public health initiative, like chlorinated drinking water, iodised salt, and pasteurised milk: all which have a therapeutic purpose, but none of which are “medical treatment”. Hi Afamildura, where have you gone? Chris / Richard, you argue, “CWF is a preventative initiative, it doesn’t ‘treat a disease’, it helps prevent it”. That is incorrect. The promoters of fluoridation regularly advertise the measure as a “constant repair kit for teeth”, not only prevention of decay. Furthermore, a product’s principle use determines its classification [ https://www.facebook.com/notes/anti-fluoridation-association-of-mildura/therapeutic-goods-and-medicinal-products-another-checkmate-for-fluoridation/372020466277005 ]. And as for the legal angle, it’s only a matter of time. Thanks for the reminder, but we will just sit back and watch as citizens find ways to bring down fluoridation on legal grounds. It has been interesting to watch the primary question being avoided. Again, we ask, what other substances should be added to public drinking water with the stated purpose of treating the human body for disease? At present, fluoride is the ONLY substance being used in such a way, but why stop there? Note we are not talking about chlorine and the like, which is added to treat the water itself, to make it safe to drink. We are referring to the use of the public water supply to treat human beings. We have already seen keen support for fluoridating drinking water supplies to treat/prevent the disease of dental caries, so we ask again, what other substances do you support adding to drinking water to treat other diseases? And which ones would be unacceptable to add to drinking water and what would be the reasons for objection? Forcing fluoridation upon communities is not exactly in this spirit. And as for the legal angle, it’s only a matter of time. It’s been 70 years now. How long is it supposed to take? It is becoming obvious that the courts can define an object that is clearly the sun as the moon if they are allowed to set a precedent and given the right case with which to change a definition. And, in this case, they have changed definitions until it suits the purpose of the government and its goals rather than using science as a goal using well established definitions. Fluoridation not a medical treatment? Pure malarkey. Actually, fluoride is the only substance placed into drinking water that is meant entirely to create a change in the human body (and, due to its long term adverse health effects, it also creates significant biological damage that most doctors are not trained to recognize – perhaps don’t recognize intentionally). By changing the definition within a court of law (this is law?) and keeping the definition within a limited range of meaning, they have essentially blocked any necessary changes that could or should be made to an insidious policy that was originally intended to avoid lawsuits against industry after World War II. What a convenient method of making a known neurotoxin look like a benevolent drug, and ridding industry of a dangerous pollution by product without legal consequences. And, the very industry that creates the pollution in the first place gets to charge us for the privilege of slow poisoning the entire population with a toxin that it would otherwise find extremely difficult to store or get rid of. And, let’s point out two things – whenever I see the Dr. Stangelove quotes or video, you can bet that whoever is using them is not using science, legality, ethics or accurate information to portray fluoridation. In other words, they haven’t bothered to do their homework. The same goes for the quote from the CDC about fluoridation being one of the top ten health achievements of the 20th Century. The use of either of these quotes shows that the user does not know their origins or how little they actually mean to the fluoridation debate. And, both are always used in a context meant to deride the credibility of fluoridation opponents. Those of us who have done our own homework know better. Both quotes are totally useless. You cite the “The Universal Declaration on Bioethics and Human Rights”, yet this document is not relevant to CWF in the slightest. Firstly, and most importantly, its provisions are not legal authority in any country unless it is incorporated into domestic legislation. Can you please point out where this is the case (in Australia would be OK) as I am unaware of any pertaining to CWF? You have Human Rights legislation in Australia, yet why aren’t you citing this? Surely this would be far more applicable? Jack, could you give specific instances to back up your claim about the high court judgement? I thought it was pretty clear and well referenced. You come across as biased (why else put “high court” in quote marks)? But let’s hear your argument using specific quotes and citations then we can make out own judgements. The natural environment is medically treating the human race wherever fluoride is naturally present in water supplies, because, you know, fluoridation is a medical treatment. The only reason the anti fluoridationists are so hell bent on defining fluoride as a drug or a medical treatment is so they can apply ethical guidelines that have been developed for completely different scenarios. Well, so far the legal , medical (whose profession the ethical guidelines have been developed for) and public heath sector reject the argument. Repeatedly. In addition the scientific community have emphatically rejected the bogus science presented (and re-presented ad nausea) by the anti fluoridation movement. Jack is a conspiracy theorist. Chris / Richard, you argue, “CWF is a preventative initiative, it doesn’t ‘treat a disease’, it helps prevent it”. That is incorrect. The promoters of fluoridation regularly advertise the measure as a “constant repair kit for teeth”, not only prevention of decay. afa, I am not arguing that CWF is a preventative initiative – this is a fact. I understand that you are married to the idea that somehow CWF is medical treatment but how do you reconcile either naturally occurring fluoride in the environment or iodised salt etc with your world view? Hi jack, do you want to engage and have a useful discussion or do you want to just have a rant? AFA, do you not understand the action of fluoride in regard to disease prevention? Fluoride re-establishes tooth enamel’s natural resistance to decay from acidic agents. It doesn’t fill caries or treat disease. The decay causes disease. No decay no disease. It helps to prevent decay occurring by ensuring an availability of fluoride, which is often naturally occurring in any case, that is incorporated into tooth enamel. the resultant strengthened enamel has increased resistance to development of disease. Wonderful stuff, fluoride. In optimal concentration a safe, efficient and cost effective public health measure for prevention of oral disease. If artificial water fluoridation, using untested, unregulated and contaminated with arsenic,lead, mercury etc chemicals is good for human teeth then STOP wasting MY HARD earned TAX money on further bogus studies on this subject. The scientists on this artificial fluoridation gravy train should pay back our taxpayer funded grants and do some real research in another area. The only trolls in regards to this subject seem to be the pro fluoride commentators with their made up names. When I find out that My tax dollar is funding your jobs there will be a senate inquiry. Australia wide in dental crisis after widespread fluoridation in every State, first commencing Beaconsfield, Tasmania in 1953 – likewise USA in dental crisis after widespread `fluoridation` first beginning in 1945 Grand Rapids Michigan. The only answer EVER was to provide access to affordable dental health care services for all the population, not the dumping/disposal of hazardous waste pollutants hexafluorosilicic acid/silicofluorides and co-contaminants of lead, mercury, arsenic, cadmium, thallium, beryllium, etc., (known as water fluoridation); into our drinking water supplies and hence also the contamination of our food chain and using the populations` kidneys as hazardous waste disposal/filtration units. This hazardous waste and co-contaminants must not be dumped in the air, rivers, oceans, creeks but dump it in the water supplies as a forced ‘medical /dental treatment’ (without informed consent !) and it magically becomes safe and effective. For some Americans, dental care means a sturdy chair, a fluoride swish, and a free toothbrush. But for one in three Americans, it’s a nightmare, including astronomical bills, crippling credit card debt, panicked visits to the emergency room, and life-threatening disease. These hardships are chronicled in a new Frontline documentary, Dollars and Dentists, which airs tonight on PBS stations. Frontline correspondent Miles O’Brien takes us behind the scenes of the documentary that explores America’s broken dental system. Frontline is produced by our partner WGBH. You can find when “Dollars and Dentists” is airing on your local PBS station here. I can assure you I am no ‘troll’. You seem not to be reading regarding names?? Is there any specific issue you wish to discuss or are you ranting too? Are you going to stick around and maybe learn something ? Diane – a newspaper article is not a study – care to cite the actual study itself? Lol, Ken’s blog must have come to the attention of the US Tea party. Diane will just continue posting her cut and paste articles relying on faulty evidence/logic and entrenched chemo phobia. I don’t think you will ever be able to win her over to your point of view Ken, because she is not willing to consider a scientific viewpoint. She is passionate, but unfortunately has fallen victim to GIGO (garbage in, garbage out). The first one only has what you quoted about fluoride. Empty vessels make the loudest sounds. Only slightly misquoted from Bill. Hello, and may I say that just because a scientist proves a chemical ‘good’ for something, it does not prove it is ‘good’ for health. There are 1000’s of drugs on the market ‘good’ to help manage symptoms – from joint pain to insomnia – but hell no, they are not good for one’s health. Just read the danger warning and side effects on the label. Fluoride in tap water is also targeting a health issue – and the community needs to understand there are UNHEALTHY side effects, and that some citizens will be affected more than others. For God’s sake, if people want to enjoy chemicals as part of their lifestyle, let them have fluoride in a salt shaker, and add their own. For those who choose organic, don’t force pesticides down their throat – a very useful analogy. Sorry, but all the science in the world proves nothing if it’s sponsored by corporations who NEED to add chemicals into nearly everything that exists. Just look up in the sky and see how many chemicals are dumped into the atmosphere to combat climate change. This isn’t the first time we’ve seen the chemtrailers and the anti-flouridationists being the same people. Can anti-vaccination or homopathic mumbo-jumbo be far behind? Global scientific conspiracy theories are like peanuts. You can’t stop at just one. I am happy that we live in a society that allows for such action to take place (as long as this is peaceful and doesn’t involve death threats as was the case recently in Australia). I still don’t understand the inherent contradictions you embrace re: medical treatment – but that’s your prerogative. I disagree with you that any ‘change’ is soon to occur, considering the history and paucity of scientific/rational reasoning. I think the current strategy (In NZ) of targetting small Councils and scaring them into submission, counterproductive. Also, if the science was on your side, this wouldn’t be necessary. I have enjoyed our discussion however – but out of curiosity, what are your views on why there is a disproportionately large number of anti fluoridationists who also embrace conspiracies? Perhaps we should lobby the council to medicate our water with appetite suppressors to reduce the number of fat people/heart disease. Just to save a few bucks on obesity . Perhaps we should lobby Governments to add iodine to salt to reduce the incidence of cretinism and goiter. Just to reduce the suffering of tens of millions of fellow human beings. Perhaps we should lobby Governments to add chlorine to tap water to reduce the incidence of typhoid, dysentry and….oh wait. Once again I note pro fluoride respondents resorting to the usual vilification, obfuscation, ignorance and bitchiness in reply to those who dare question the claimed safety, benefits and effectiveness of adding a chemical to our drinking water to treat/prevent (depending on which pro-fluoride study one reads) the disease of tooth decay. With all due respect, engaging in that sort of rubbish does you no credit at all nor does it do what science should do and that is provide better research outcomes. Karl Popper advised scientists “Let it be your ambition to refute and replace your own theories”. It is obvious from your approach in this blog that you are of the same school as Sir Peter Klugman and have decided that the science around fluoridation has long since been settled. I am curious as to when that actually happened because in the Journal of the American Medical Association, Sept 18, 1943, the Editorial stated. “We do know that the use of drinking water containing as little as 1.2 – 3.0 parts per million of fluorine will cause such developmental disturbances in bones as osteosclerosis, spondylitis and osteoporosis, as well as goitre, and we cannot afford to run the risk of producing such serious systemic disturbances in applying what is at present a doubtful procedure intended to prevent development of dental disfigurements”. What was the science that refuted those claims and when was it developed? It seems to this relatively uneducated soul the pro fluoride people have moved from science to ideology, from looking for answers to wearing blinkers and from addressing the messages to attacking the messengers with vitriol and abuse. I was a bit bemused and amused after the last council meeting Ken when you threw Jonathan’s IQ study in the rubbish bin. We had a bit of a giggle about that! Y’all have a happy day! causes adverse health effects of the elderly, diabetics, in those with kidney dysfunction, the malnourished and low socioeconomic families. None of the above conditions can be explained by a fluoride aetiology, according to recent major reviews, NHMRC (1999), WHO (2002), York (2000) and MRC (2002). The WHO report (2002) concludes “all organisms are exposed to fluoride. Epidemiological studies show no reasonable evidence of adverse effects of controlled fluoridation on morbidity, mortality, cancer, bone fractures or genotoxic effects. Neither was there evidence that consumption of drinking water was associated with mutagenicity, systemic effects on respiratory, haemopoietic, hepatic or renal systems, nor reproductive or developmental organs”. The York Report (2000) states “insufficient evidence is available to reach a conclusion that bone fractures, cancer, or other adverse health conditions were associated with fluoride in water”. The NHMRC report (1999) states “the purpose of this review instigated in 2002 was to consider the conclusions and recommendations of the York Report (2000) and conclude on what further research was required on fluoride and health. Their conclusions were that ‘there is insufficient evidence to establish a link between fluoridated drinking water and health, apart from a decreased risk of dental caries and increase in dental fluorosis. No increased risk was identified for bone or other cancers, hip fracture, osteoporosis, kidneys, or immune systems’”. The MRC (2002) report concludes “no links were evident to support claims of adverse health outcomes (non-dental) from fluoridation, such as bone fractures, cancer, immune system defects, reproductive, kidney, gastrointestinal tract and developmental defects. Also discounted were effects resulting from chemicals used in fluoridation”. No particular urgency for further studies on adverse health effects was recommended. The only additional recommended research was into the trends in fluoride exposure in relation to dental fluorosis and other similar looking tooth defects. Wow. That’s what I get for just browsing along and thinking, oh, this is interesting. I wonder what the comments are like. Had no idea this was such a contentious issue. But then, I’ve been drinking the fluoride for a long time. I wonder whether Liz’s comment is simply a vehicle to spam the commercial toothbrush link via link in her moniker.